Tinctures are highly concentrated liquid herbal extracts made with either dry or fresh herbs. They are the most convenient way to take your herbs and have a longer shelf life than other methods. Tinctures are highly concentrated liquid herbal extracts made with either dry or fresh herbs. They are the most convenient way to take your herbs and have a longer shelf life than other methods. There are generally three kinds of solvents (called menstrums) that are used to extract the medicinal properties of herbs into a liquid extract. Each have pros and cons, which will be explained so you can decide what would work best for your situation. The three menstrums to choose from are alcohol (the most commonly used), vegetable glycerin and vinegar. ​80-100 proof Alcohol: This is the menstrum most commonly used and is what you will find in an herbal tincture you purchase from the health food store or online herbal store. Alcohol has many benefits over the other two solvents. It has the longest shelf life, indefinitely, and it makes a more potent tincture due to its ability to extract more of the constituents in the herb than any other liquid. In fact there are some herbs that require alcohol in order to get to the medicinal qualities. These herbs include; Lomatum, St. John’s wort, black walnut hulls, gumweed, teasel and usnea. I was concerned about using alcohol due to my beliefs of not drinking alcohol and couldn't imagine myself walking into a liquor store to purchase it. I came to the realization that I am not drinking alcohol, I am taking medicine and most over the counter medicines and food extracts have just as much alcohol content as an herbal tincture anyhow. Alcohol also dissipates very rapidly with heat so adding the tincture to hot water before taking removes all alcohol content, leaving only the healing properties of the herb. I love this post from Strangers and Pilgrims on the use of alcohol for herbal medicine: Should You Make Alcohol Base Medicine? Alcohol Tincture How To: First prepare your herbs by chopping them finely. Let them sit to dry wilt for a couple of hours to remove some of the moisture. This is not a set rule but will make a more potent tincture. Fill a jar ¾ full of the herbs, then pour alcohol over them, leaving ¼ inch head space. Cover with a tight lid and let sit for anywhere from 2 – 6 weeks. After the first day, check the bottle to see if the herb has absorbed all of the vodka. Add more alcohol to keep at the ¼” head space level. Strain and then pour into airtight containers, label and store in a dark, cool place. Glycerin has the capacity to break down and remove certain chemicals and preservatives from the body. It is demulcent, emollient, soothing and healing when diluted with distilled water. It also has a sweet flavor which is more suited for children and elderly. It also has the benefit of being heated over short period of time, which will make a fast tincture. On the down side, a glycerite will only last 3–5 years and is not as potent as an alcohol tincture. Storing them in a fridge will help prolong the shelf life. Stephen Buhner says that if you add 10% vodka to a glycerin tincture, it will store indefinitely. Glycerites are my favorite way to make a tincture and I've never had one go bad keeping them stored in a garage fridge. Make sure your purchase food grade vegetable glycerin. This can be purchased online or at a health food store. 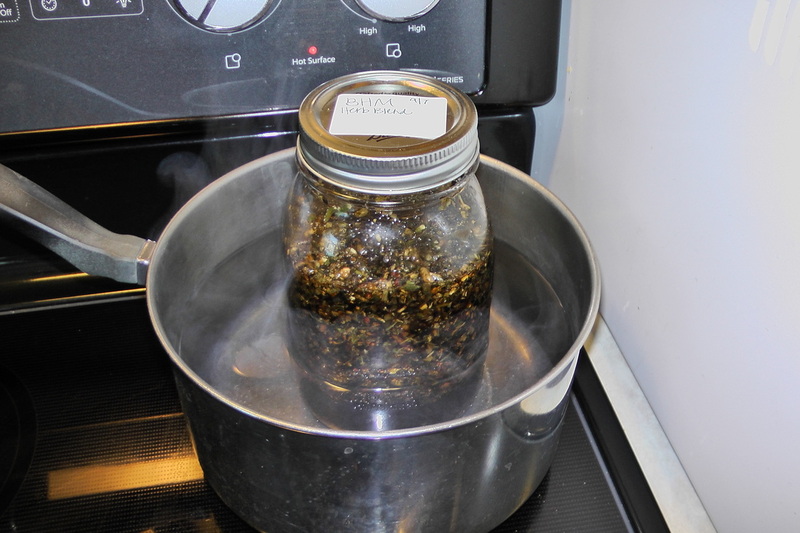 There are a couple of ways you can make glycerite. Fill your jar a quarter to half full with herbs, depending on if they are fresh or dried, you want about two inches of menstrum above the herbs. Bring some distilled water to a boil and pour over the herbs until just barely covered, fill the jar the rest of the way with vegetable glycerine and stir or shake to combine. Label and then place in a warm, sunny spot for 4-6 weeks shaking daily or follow the instructions below for a quicker glycerite. Prepare the tincture as instructed above. Place a towel in the bottom of a pan and fill with water, place the jar into the pot. You want to get the water just below the rim of the jar if possible, covering as much of the liquid in the jar as possible. The glycerite pictured needs more liquid added to the pan. Bring to a boil and simmer over low heat for several hours, I usually let mine go all day up to 3 days. Shake the jar periodically and fill the pan with more hot water as needed. Remove the jar from the pan and let sit until cool. Strain, re-bottle and label. Store in a cool, dark location where it will keep for 3-5 years. 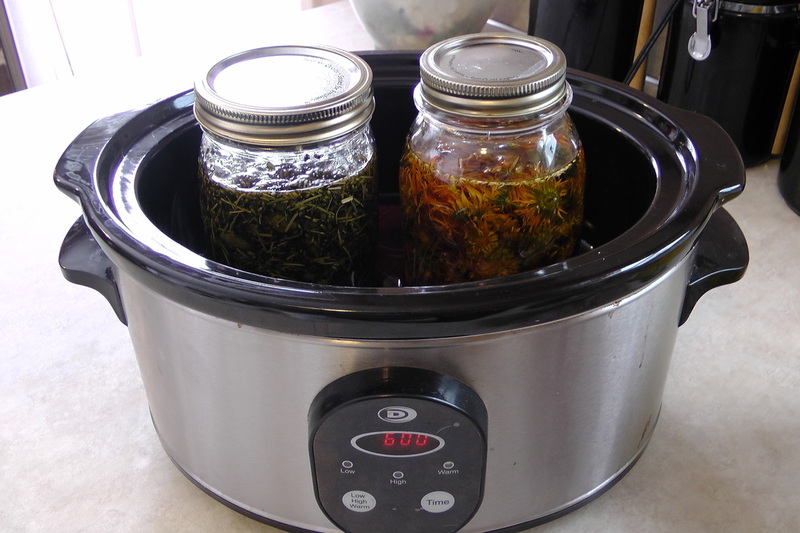 You can also use a crock pot and I take advantage of the space by doing two jars rather than one. Place a towel in the bottom of the pot and fill with water, place the jar(s) inside and turn to low for an hour or two and then to warm for another couple of hours. Again I let mine go about 3 days, keeping the water line where the herbs are in the jar. Vinegar tinctures are used mainly for culinary and personal care purposes, they do not pull medicinal properties as well as alcohol and glycerin and they only have a shelf life of 1 year. You can also use white distilled vinegar for making herbal tinctures used for cleaning purposes, such as a multi-purpose cleaner. 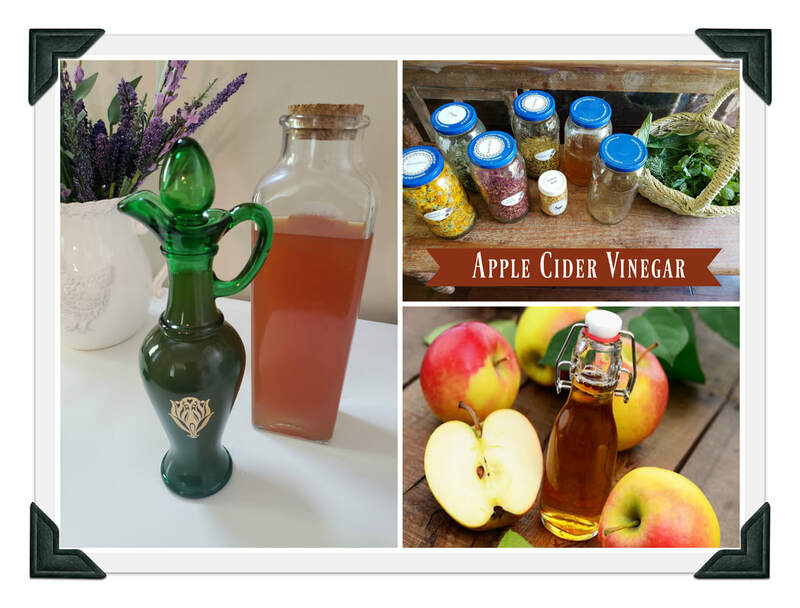 Advantages for using ACV; it’s a renewable resource that you can make at home, it is high in vitamins and minerals and can be easily incorporated in your regular meals, making it a great choice for a tonic. It’s also great for your hair and body, making it a good match for hair rinses and skin toner. The only difference for making a vinegar tincture vs. an alcohol tincture is warming the vinegar before adding it to the herbs. This will help release the herbal properties from the herb since vinegar doesn’t break down the constituents as well. Keep it in a warm, sunny spot for 4-6 weeks. Then strain and bottle. For every quart of water add ¼ cup of sugar and stir until dissolved. Fill a jar with apple scraps (peel, core, stems, etc.) and pour the sugar water to just below the rim. Keep the scraps submerged in the water. Cover loosely with a lid. Keep in a dark location for a week. After a week check for bubbles, if there are bubbles, strain the liquid out and place in a new jar. If no bubbles, wait until there are some before straining. Cover the new jars with cheesecloth or a coffee filter and place in a dark location for 6 weeks. Check for a vinegar smell, if it still smells like alcohol, let it sit longer until it gets the vinegar smell. It’s ready to go now. Making your own extracts and tinctures are the most frugal way to go, however, if you would rather purchase them, Mountain Rose Herbs offers a wide variety of extracts and a few glycerites. You can also find them at health food stores, Amazon, and Dr. Christopher's Herb Shop. ​These are made just like a tincture and oil extract but when it is used externally the name is changed to a liniment. Liniments are used to disinfect wounds and for sore, aching bones and muscles. They can be a traditional tincture made with 80-100 proof vodka, an herbal oil, or a tincture made with rubbing alcohol. 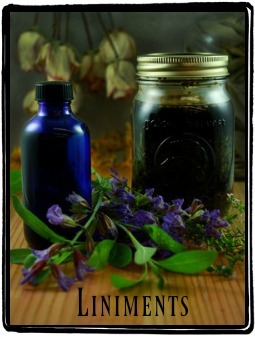 For more information on what a liniment is and details on how to make one, including a recipe for Kloss liniment - visit the Mountain Rose Herb blog page on herbal liniments, here. Witch Hazel is another way you can tincture your herbs. Herbal witch hazel is generally used for personal care products and cosmetic preparations. I use it in my bug spray and facial toner. You can read more about the property of witch hazel here.